Winter is winding down in the northern hemisphere, and as the first, bravest flowers peek their little-budded heads out of the topsoil, it’s time for all the folks with ATVs on the brain to turn their thoughts toward initial springtime maintenance. A lot of people view this as a burdensome chore, but you shouldn’t. In fact, you should look at it as an opportunity, because the ATV-centric version of Spring cleaning is your chance to dip your rig in the fountain of youth. A properly “sprung” ATV will serve you well throughout the entire riding season, and of course, the sooner you complete the process, the sooner you can start riding! If you’re new to ATVs and keeping in them fighting trim, this pre-ride maintenance check is probably a daunting prospect, but don’t worry – it’s totally doable. In fact, even old hands can use a refresher now and then, and as it happens, your friendly neighborhood Gold Eagle techs have a simple springtime maintenance checklist for just such a need! 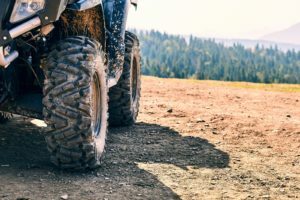 Keep reading to learn precisely what you need to do in order to have your ATV purring like a kitten just in time for your first warm weather ride. The first thing you’ll want to do when de-winterizing any ATV is change the oil. Most ATVs use a dual-feed system in which the engine and transmission are served by the same change (you’ll want a dual / complete lube oil if such is the case), but this isn’t always so. Check your owner’s manual for specific information. Also, don’t forget to change the filter! You wouldn’t go outside without any pants on, so don’t run fresh oils and lubricants through a dirty filter! As with oils and lube, brand specificity can have a hand in your filter selection. Again, consult your owner’s manual for information on the filter that fits your engine best. A note: Brands rarely matter – pay for quality and performance, not just a big, recognizable name. They aren’t always the same thing. Step Two: Ladies and Gentlemen, Start Your Engines! You know what really stinks? Getting your ATV all prepped and ready to ride only to find that it won’t start no matter what you do. No matter how scrupulous you are in your care of your machinery, the fuels and other internal fluids used in your ATV have a tendency to settle. It’s just how they work. This can make starting them up a pain in the neck (and the arms and shoulders and back, too!). Never fear, though – a solution exists! Just pour a slug of Gold Eagle’s Start Your Engines! 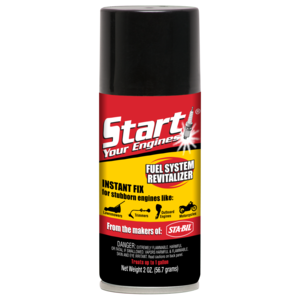 ® Fuel System Revitalizer into the gas tank of your ATV and watch it go to work! It will revitalize your fuel while simultaneously de-griming any dirty bits in your fuel system. Adding this to your maintenance routine will virtually eradicate idling problems, stalls, and of course starting complications. Want your ATV to start up the first time, every time? Give it a shot of Start Your Engines! While you’re inside the guts of your ride, it’s always a good idea to check the state of your spark plugs and other miscellaneous components. If they need swapping out, now’s the time. Don’t worry, it should be a quick, simple process. Doing this check will also remind you to make sure you’ve installed one or more spark arrestors if your local jurisdiction requires it. Chances are good that you’ll need one if you live in dry, wildfire-prone areas. Not sure if you have one installed already? Sticks a bit of stiff wire into the exhaust of your ATV – if something blocks further progress after an inch or two, then you’ve got an arrestor in place. If not, any mechanic worth their salt can install it for a fee. Annual ATV tire maintenance is a “good news, bad news” situation. The good news is, quality ATV tires won’t need annual replacement unless you purposely set out to obliterate them via extreme riding habits. Pressure checks and / or a rotation is almost always sufficient to get you through at least two riding seasons. The bad news is that whether it’s because of the ravages of time, a puncture, or some other eventuality, you will have to replace one or more tires eventually. This can translate to quite the expense, especially if you’re swapping out an entire set. Even so, never neglect your tires, whether it be in matters big or small! Poor tires can result in accidents, injury, or even death. If they need to be inflated, rotated, or replaced, do it ASAP and consider it an investment in yourself and your ATV. Step Five: Tag, You’re It! Ready to ride yet? Sure you are! There’s just one more thing you need to attend to, and then you can go play in the mud. It’s time to make sure you’re legal! In almost every state, province, or other jurisdiction, ATVs are required to be tagged, registered, licensed, and adorned with stickers. You may be able to get away with skipping some or all of these requirements if you live on a large swath of private property, but they’re a must if you ever want to head out on public trails, roads, and so forth. Each jurisdiction’s laws and requirements differ, so contact your local DMV or equivalent for up to date info for your area. Don’t neglect this step, either – nothing will put an end to your fun faster than a nasty run-in with the cops and a big ol’ fine! Well guys and girls, there you have it: A step-by-step rundown of pre-ride ATV maintenance. Stick to it, and you’ll be riding like the wind before you know it. Thanks for reading, and have fun out there!